Today, I’ve got another fun book to share with you. Again, it’s a counting book, but this one features apples and silly animals. Ten Apples Up On Top by Theo. Leseig is a fun book about three friends trying to balance counting and fun. When a lion, a dog, and a tiger meet up, they discover that they can each do different things while balancing apples on their heads. Whether drinking milk, jumping rope, or roller-skating, they can do a lot with ten apples up on top! Then, they meet Ms. Bear. Watch out, she has a mop! She’ll knock those apples from up on top. 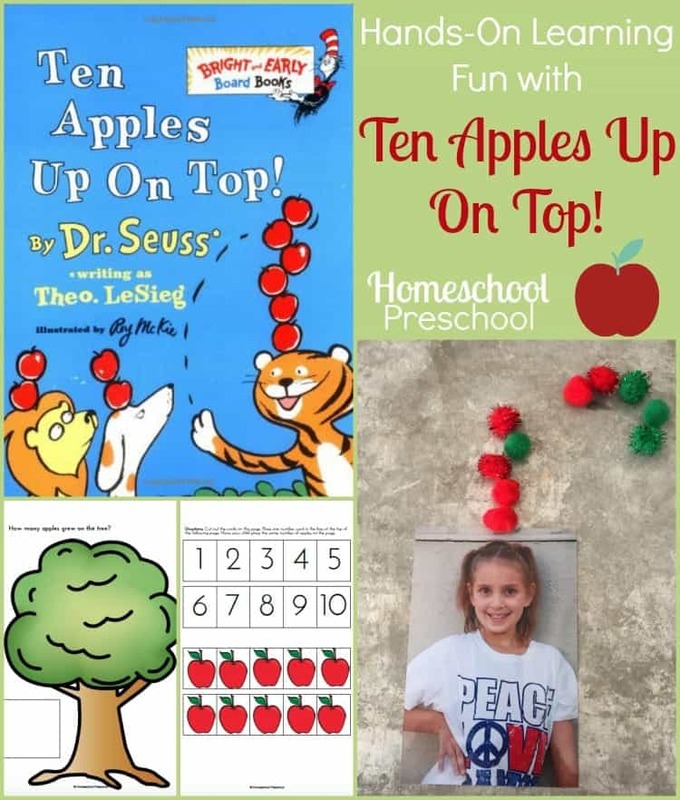 Let your little ones practice their counting skills by acting out Ten Apples Up on Top. Have them draw a picture or use a photograph of themselves. 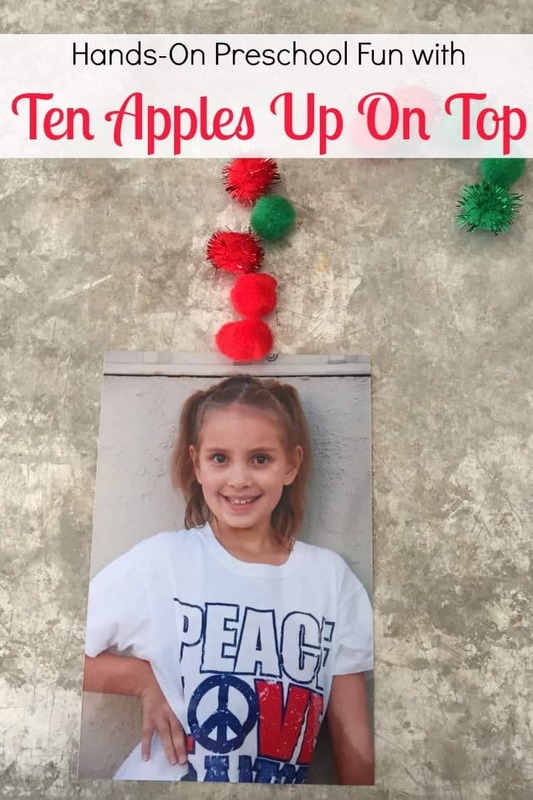 Put a magnet (I used magnet tap e) on the back of the drawing or photograph. Place the picture on a magnetic surface. The refrigerator or a cookie sheet will work well. Put magnets on each of ten red pom-pons . If you don’t have enough red pom-pons (like me), you could also use green or yellow since apples are those colors, too. As you read the story aloud, your preschooler can put the apples on top of their picture on the fridge/cookie sheet. 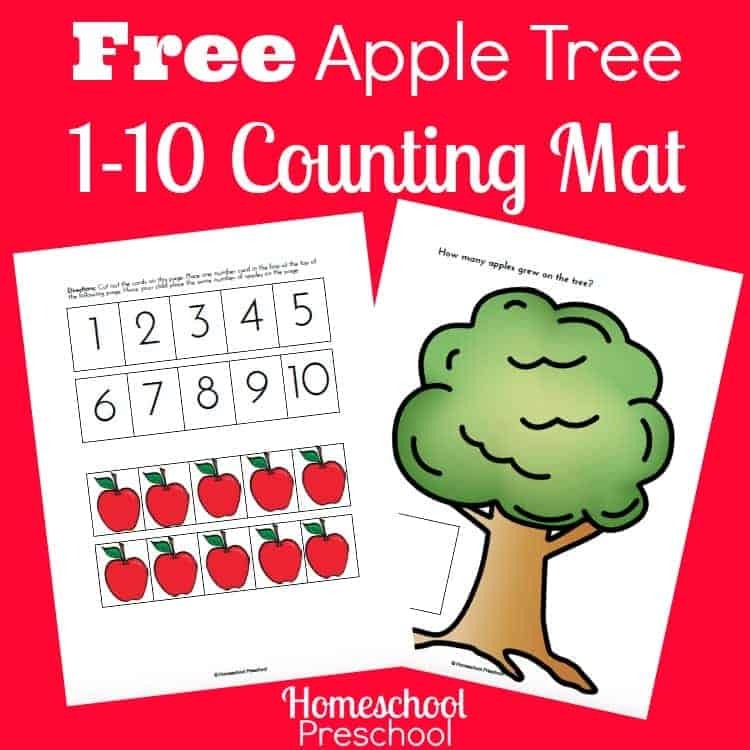 Print out the apple tree counting mat. Have your child choose a number card and place it on the mat. Then, have them place that many apples on the tree. Click here to download your free apple tree counting mat.